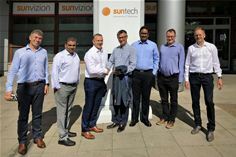 Germany/India, October 23, 2018: Suntech, a leading provider of innovative OSS (operations support systems) solutions, has announced that it has signed a non-exclusive business alliance agreement with Cyient, a global provider of engineering, manufacturing, geospatial, digital, network and operations management solutions. Through this agreement, Cyient and Suntech intend to jointly pursue business opportunities globally in the communications industry by leveraging both company’s technical proficiency, market reach, and domain knowledge. Cyient’s expertise in system integration, operational excellence and global delivery model combined with Suntech’s advanced and specialized technology will offer customers best in class OSS solutions. Relationships form the core of how Cyient works. With nearly 15,000 employees in 21 countries, Cyient partners with clients to operate as part of their extended team, in ways that best suit their organization’s culture and requirements. Cyient’s industry focus includes aerospace and defense, medical, telecommunications, rail transportation, semiconductor, utilities, industrial, energy and natural resources. Suntech is a leading supplier of OSS/BSS applications for cable operators, mobile network operators, and internet service providers. The company was formed in 1996. Suntech solutions are available under the SunVizion brand name. The flagship product, SunVizion Network Inventory & Planning, is an innovative system for inventory of both logical and physical network elements combined with support for network planning process. This solution works with any network technology and with all types of networks. In-built workflow engine supports the processes related to network management and the sale of services. Intelligent discovery and reconciliation mechanisms improve the accuracy of network data. SunVizion solutions bring value to millions of subscribers worldwide.